The secret to great quilting isn’t necessarily knowing how to quilt a perfect design, it’s knowing how to hide your mistakes! In this funny and encouraging trunk show, I will share my secrets for hiding or highlighting elements of your quilting. Whether it’s drawing attention from piecing that’s more “organic” than precise, or showing off that design that you finally nailed, you will leave excited to finish the quilt tops that you may have in your UFO pile or laying around the house. Join us for a night out on the town! Come enjoy a cocktail party with hors d'oeuvres, a trunk show and a lecture Angela wrote just for you! In addition to the gorgeous historic setting in an award-winning winery, we have several surprises in store for you! This will truly be a uniquely fun night of inspiration and community for machine quilters of all types and skill levels! Your tickets will be held at under WILL CALL at the door, beginning at 5:30pm. We recommend purchasing tickets in advance. Each ticket will come with three pull-off tickets: (1) Drink Ticket, (1) Entry Ticket for the Prize Drawings, and (1) Surprise Gift Ticket redeemable at our studio. The first 20 people in the door will receive a FREE #LivingTheThreadLife static window decal. Take this as an opportunity for a night out on the town and dress in your best dressy casual with smart shoes. The floor at Barrister Winery is rustic and shoes without heels are encouraged. Our hors d'oeuvres will include a gourmet cheese board, vegetable crudite with an assortment of dipping sauces, house smoked salmon with fresh herb dip, a Mediterranean plate, and a light dessert selection. The hors d’oeuvres will be available through 7:45pm and the desserts will be laid out at 8pm. Be sure to bring your valid photo ID if you will be drinking, as the bartenders will ask to see it. If anyone in your party is underage, please let us know when you pick up your tickets. There will be plenty of non-alcoholic beverages available at no charge. We strongly encourage safe driving, so please choose a designated driver for your group, or if you are staying at a hotel, consider their shuttle service, or calling a taxi, Uber, or Lyft. This event is taking place at Barrister Winery at 1213 W. Railroad Ave, Spokane.WA 99201. 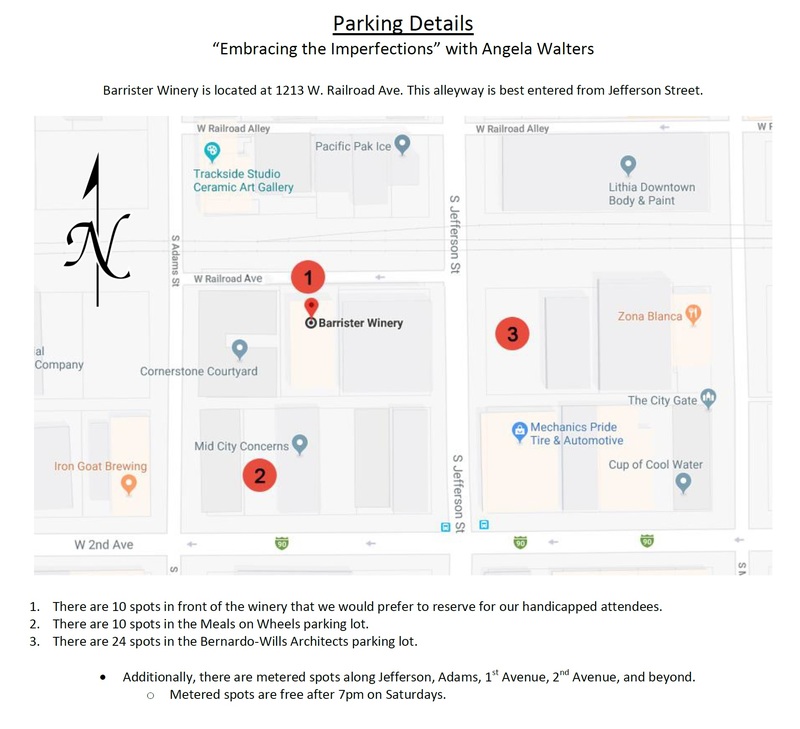 Parking details have been added below and to the Facebook event. We strongly encourage carpooling and recommend using the Facebook event as a way to reach out to fellow attendees to make plans. Click here to enter your address to get driving directions from Google Maps. Hang on to your tickets as there will be prize drawings held after Angela's lecture. Each event ticket is numbered and we will collect your coordinating numbered drawing ticket when you walk through the door. Have your tickets handy in the event we call out your number. These prizes include a gift basket from The Quilting Bee, batting from Hobbs Batting, thread from Fil-Tec, and a set of Angela's new rulers! You must be present to win. Please remember to turn off your cell phones during Angela's lecture. You are welcome to move about the winery during the lecture to grab a second helping of food or drink, visit the restroom or chat with new or old friends, just please keep your conversation to a minimum during this time, so everyone has the opportunity to hear Angela speak with minimal distraction. We also want to let you know that while there is every possibility that you will be able to speak directly with Angela, we make no guarantees that you will have one-on-one time with her during this event. There will be a table selling some of Angela’s products, and cash or check will expedite those sales. Please let us know if you still have questions after reviewing this information. We look forward to seeing you!